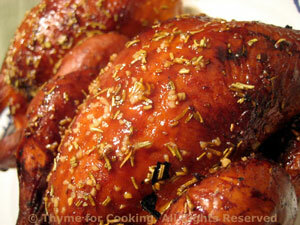 Grilled Cornish Hens, Thyme for Cooking easy gourmet dinners. We grilled two hens and had almost half left of each. Save the rest for the salad on Monday. 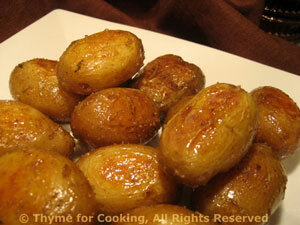 The skillet roasted new potatoes happened because of a broken oven... Very easy, very tasty. This will be the last of the new potatoes for the season. This is a wonderfully, flavorful, simple salad. Allow the asparagus to marinate in the vinaigrette for 10 - 20 minutes before adding the rest of the ingredients and serving. In a bowl, large enough to hold all of the ingredients, mix soy sauce, vinegar and oil. 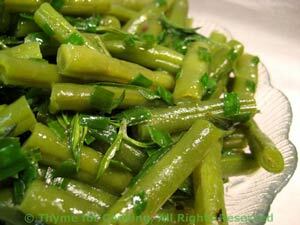 Snap off ends of asparagus. Roll cut asparagus in 1.5 inch (4 cm) lengths. When boiling, drop in asparagus and parboil for 2 minutes. Cut avocado into cubes; add to asparagus. 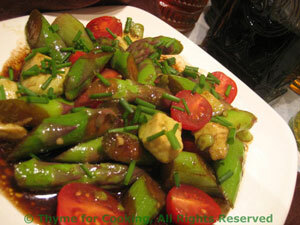 Slice cherry tomatoes in half; add to asparagus.